The following is a list of the steps done using Harmony in a cut-out animation workflow. This will help you understand how the work is divided and give you a base to start building your own cut-out pipeline. The layout and posing process links the storyboard artist and the animator. The layout artist uses the storyboard and prepares an organized folder for the animator. This folder contains a field guide that shows the proper camera move and the right size of the scene. It also includes the character's main poses from the storyboard following the official design, and the effects, backgrounds and all the other information necessary to the animator. The backgrounds are done directly out of the storyboard and location design. A background is a section or an angle of a location. The background artist refers to the storyboard and draws the background for each scene. Once the background is completed, it is added to the layout folder. In a cut-out or paperless animation process, this step can be done digitally or traditionally. This will depend on the user's preferences.This step is mainly applied to larger productions. An individual user can move directly from the storyboard to the animation. This step can be done with Harmony, but Toon Boom also has another software developed for this. Toon Boom Storyboard Pro has optimized tools to create the layout and posing. The breakdown step is really important in the cut-out workflow. The person doing the breakdown has to take the final character or prop model and start building the puppet. This means deciding which parts will be separated and preparing all of the joints and views for the animators. Once the parts are broken down, the character or prop must be rigged. This means attaching the parts (hierarchy) and assigning the appropriate pivot points. This step must be done with care because these puppets will be distributed among all the animators later and you do not want to duplicate mistakes throughout the project. When the character and prop rigs are ready, the breakdown artist stores them in the library as templates to be shared with the rest of the team. The library is a central element of a digital cut-out production. It contains all the assets for the animation and scene set up. The library is a central location where all these templates are stored, organized and made available to the animators and scene setup team. The library should be structured so that everyone using it can easily find the assets they require. Someone should be assigned to manage the library so that it remains well organized. This person is often the breakdown artist, but it depends on each studio's structure. When the library is built, the scene setup person and the animators will start using the assets. The scene setup consists of preparing the scenes for the animators and is similar to the traditional layout and posing. Following the storyboard and the animatic, the person working on the scene setup will import the assets needed for the scene animation, as well as import the animatic reference and often position the camera. 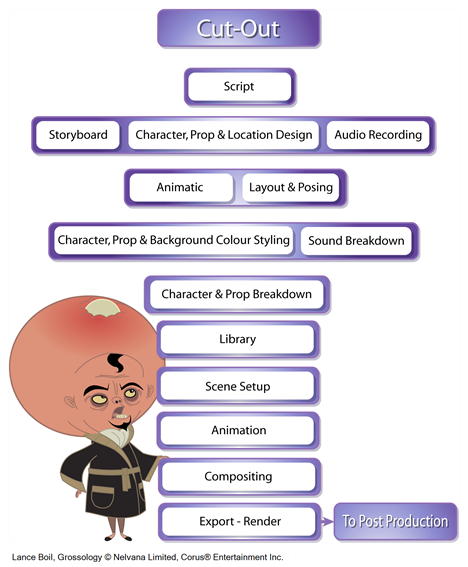 When the scene setup is completed, the scene can be passed on to the animator who can start animating without having to mount the scene. Cut-out animation is a vast subject. There are many techniques employed by different studios and animators. Basically, the animator moves the parts frame by frame to animate the puppet. The animator may even start their own pre-compositing, camera moves, and trajectories. This depends on the user's workflow. Once the animation is completed and approved, the scene goes to the final compositing and effects. The compositor imports the coloured background, animatic reference and sound as required. Referring to the exposure sheet, animatic and animation, the compositor assembles all these elements and creates the camera moves and other necessary motions. Finally, the compositor adds any digital effects required by the scene. These can include tones, highlights and shadows. When the compositing is completed, the final step is the rendering. Once the compositing is completed, the last step is to render the scene as a movie or an image sequence. Generally, the compositor will be the same person doing the render.